People donate far more money than they realize. Charities, tuition programs, schools, private organizations, and even spring cleaning yield opportunities for donation. It’s easy to discount them. Your child’s school fundraiser in September. A cash donation to the state military relief fund in December. Spring garage sale proceeds to the TANF. Individually they may not look like much, but they can really add up in the long run. Cash donations to schools, private organizations, qualifying charities, and tuition organizations in Arizona can significantly reduce your taxes with credits. It provides two-fold by reducing what you owe Arizona in taxes and giving you an advantage on your federal tax return. A federal reduction only occurs if you itemize your deductions though, so keep all of your donation receipts in one place. Let’s look at an example. A married couple with a combined income of $82,600 is filing jointly. They’ve already filed $20,000 in non-charity related Schedule A deductions. We’ll look at what they owe in taxes with and without charity related Itemized Schedule A deductions. In our example, itemized charity related donations for the couple totaled $1,600 dollars for the year. 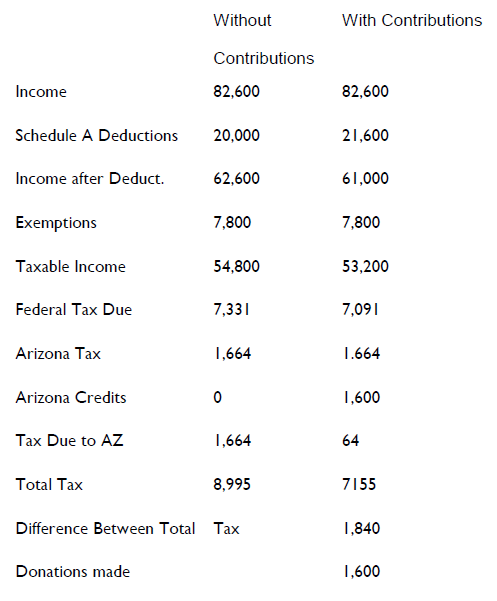 If you’ll look at the Arizona Credits row you may have noticed that without contributions their credits were 0. With contributions, their credits equaled the amount they donated to charity. This is because charitable contributions provide Arizona tax credits at a 1 to 1 ratio. Donate a dollar, claim it, and you now have a one dollar tax credit. These can be used at that very same 1 to 1 ratio to reduce the taxes you owe to Arizona. Donate a dollar, claim it, and now you pay one dollar less to Arizona when your taxes are due. Best of all, credits roll over. If you accumulate more than the total dollar amount in taxes you owe the state of Arizona, they will automatically carry over into next year’s taxes. Since charitable donations reduce the taxes you owe the IRS, our couple was also able to save an additional $240 dollars on their federal taxes as well. There are 4 different tax credit opportunities available to individuals that provide Arizona tax credits. A complete list of applicable charities can help you determine where you would like to donate your money. The maximum contribution for this tax credit is $400 for a married filing/jointly and $200 for a single individual. Beginning in 2013, those who contribute to a foster care agency can donate an additional $400 as a married filing jointly, or $200 for an individual. Itemized deductions are not necessary in order to claim a credit for contributions to a qualifying charitable organization or qualifying foster care charitable organization. This credit helps assist Arizona military families in times of need. It helps families of Arizona service members who are currently deployed, have been injured or killed while fighting the Global War on Terror, or are facing hardship caused by their deployment. They can receive assistance to ease any financial crisis they may encounter. This fund caps at 1 million dollar so make sure it still accepting donations before donating. The maximum contribution for this tax credit is $400 for a married filing/jointly and $200 for a single individual. Anyone may claim a credit for a donation to a school tuition organization for scholarships to private schools. The maximum contribution for this tax credit is $1070 for a married filing/jointly and $535 for a single individual. If you maximize your contribution an additional credit becomes available. Although you cannot decide to whom the money will go, you can suggest an individual. If they are new to the school they may qualify for a tuition reduction. This is available to filers who payed fees directly to Arizona public or charter schools for the support of extracurricular activities. This includes school sports. As of 2015 it also includes testing fees. The maximum contribution for this tax credit is $400 for a married filing/jointly and $200 for a single individual. If you add up the maximum potential for tax credits it comes to a total of $3734 for a married filing/jointly and $1867 for an individual before additional credits are earned with an Arizona Private School Tuition Credit maximization. With the carry over you could easily cover your Arizona state taxes this year and into the next. If you need help determining your tax deductions, tax planning, or other accounting needs don’t hesitate to schedule an appointment with LBS Tax.